Many people look down on people playing junior college basketball. It is frowned upon so much that you would think that it is some type of curse. But in many ways, it is an opportunity for kids that do not have the opportunities to play in a Division I college because of academics or lack of offers. Enter the Unsigned Hype Showcase, created by James Barrett, a former college basketball player out of Sam Houston State University, who created this event in 2013. 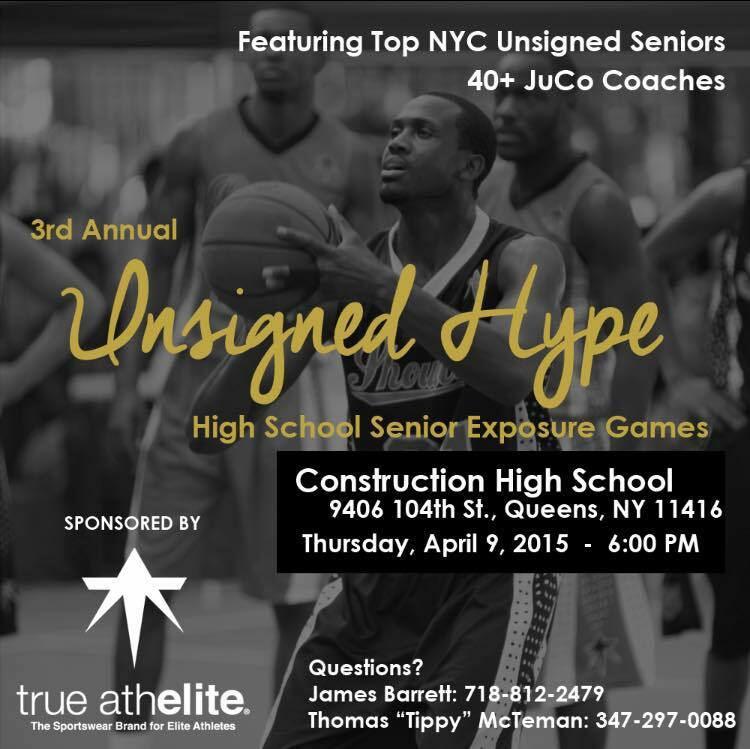 This event, in its third year, will be taking place April 9th at the High School of Construction in Queens, NY. This event has been responsible for sending at least 50 players to college, and so far three players from that group have ended up at Division I colleges, such as Seton Hall, Canisius, Niagara and West Virginia, respectively. This year’s crop of players that will be invited to the camp will be players such as Elijah McNeely of Cardozo, Ryan Preston of South Shore, Jaquan McKennon of Thomas Jefferson, Elijah Bailey of Long Island Lutheran, Emile Lewis of WHEELS & Craig McKenzie of Brooklyn Collegiate. They will be part of a crew of hopefuls that will compete for a chance at a college scholarship. This event will be a great opportunity for colleges on many levels such as the NCAA, NJCAA or the NAIA, to recruit a blue-chip prospect. With the NCAA raising their grade point average requirements to a 2.3 to a 2.0, it is imperative that junior college is a great option for players with academic woes. That is where the option of the Unsigned Hype Showcase comes in. What was your mission for the event? My goal was to try and help and give people as many people the opportunity to go to college as possible. Why do you think junior college basketball is frowned upon? Because not too many people know too much about junior college basketball. Junior college basketball is another option to go to school for free. Do you think because of these kids academic woes, JUCO basketball will be more & more competitive? Junior college basketball has been competitive for a long time. It is going to be competitive. I believe that a lot of kids in the city are going to those colleges because they are not given enough guidance at an early age and fall through the cracks of academia. Where do you think this event will go in the next few years? I believe the event will be regional. In the first year, there were kids from Washington, DC. Now there will be kids from places like New Jersey and Connecticut. If a kid is a high school senior & has no offers, which option would be wiser for him: a year of prep school or JUCO? It depends on the kid and what his family wants for him. If you go to a junior college, you will gain better than going to an unaccredited prep school. Most of the big-time prep schools will take kids that have big chances of going Division I.